According to Physics all the qualities in the universe have their origin in the Unified Field of Natural Law, which we take to be the Constitution of the Universe from the perspective of modern science. The complete account of the Constitution of the Universe is available in the ancient and timeless Vedic Literature. Throughout time, the eternal Constitution of the Universe has been managing the orderly evolution of all levels of manifest creation; it is the non-changing basis of Natural Law—the ultimate source of order and harmony displayed throughout the universe. In his book, Maharishi’s Absolute Theory of Government, Maharishi describes the forty values of the Veda and Vedic Literature in terms of the administering intelligence of Nature, the Constitution of the Universe. These forty fundamental values of the Constitution of the Universe are the forty qualities of consciousness, or intelligence, of the individual as available in Rk Veda and the Vedic Literature. This timeless knowledge of Maharishi’s Vedic Science has now also been substantiated by recent advances in modern Physics and other disciplines of modern science. In this scientific age, Quantum Physics has discovered the single, universal field of intelligence as the Unified Field at the basis of all forms and phenomena in the universe. The laws governing the self-interacting dynamics of the Unified Field constitute the most fundamental level of Natural Law and the basis of all known Laws of Nature, and therefore can be called the Constitution of the Universe. The essential qualities of the Unified Field—the fundamental characteristics of the Constitution of the Universe—have been derived by quantum physicists from a detailed analysis of the Lagrangian of the Superstring (refer to the following chart and to the more detailed derivation given on pages 26–27 of Maharishi’s book Celebrating Perfection in Education). This Lagrangian represents the most compact mathematical expression of the detailed structure and dynamics of the Unified Field; it is the mathematical formula expressing the Constitution of the Universe from the perspective of modern science. Thus both Maharishi’s Vedic Science and modern science have located the same essential characteristics of the Constitution of the Universe. These same qualities of the Constitution of the Universe are also expressed in the structure and functioning of the human physiology and the entire universe. 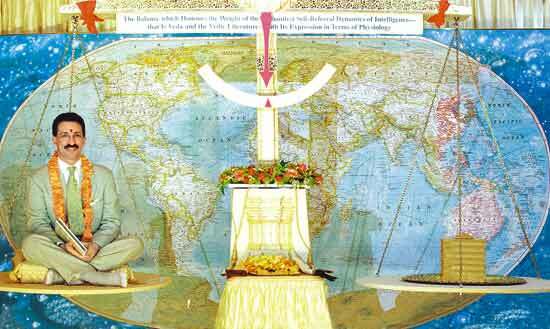 In honour of his discovery, Professor Nader received his weight in gold at a historic celebration in February 1998 at Maharishi Vedic University in MERU, Holland, in the presence of Maharishi. This discovery has been appreciated by scientists and political leaders throughout the world, including the Presidents of India, Mozambique, Lebanon, Turkey, and Trinidad and Tobago, and the Maronite Patriarch of Antioch and of all the Middle East. From 12 October to 16 October 2000, during a five-day coronation ceremony (Rajyabhishek), Professor Tony Nader was crowned the First Sovereign Ruler of the Global Country of World Peace, which has as its constitution Rk Veda, the Constitution of the Universe, and its authority in the invincible organizing power of Natural Law, which naturally and eternally governs the evolution of all life everywhere. On 17 October 2000, Professor Nader—honoured with the title ‘Nader Raam’ in keeping with the tradition of the Royal Rulership of Raam, the Rule of Natural Law—graciously accepted his new role and announced the forty Ministries of the Global Country of World Peace, each upheld by the total Constitution of the Universe—forty values of the Veda and Vedic Literature— and also especially highlighted by one of the forty. The second chart below summarizes the historic discovery of Professor Tony Nader, MD, PhD, who, under Maharishi’s guidance, identified the precise correspondence between the forty fundamental structures of Natural Law and the fundamental structures and functions of human physiology. It presents the forty qualities of Natural Law expressed in the terminology of the Vedic Literature and in the terminology of modern Physiology. Thus, the forty qualities of the Constitution of the Universe—the forty qualities of Natural Law that comprise the Constitution of the Universe—have been located in terms of their forty corresponding structures and functions in the human physiology and in the forty qualities of the Lagrangian of Superstring Theory—the most fundamental structure of Natural Law from modern science. As the conscious mind identifies more and more fully with the Unified Field of Natural Law—the Constitution of the Universe—through Maharishi’s Transcendental Meditation and TM-Sidhi Programme, the beautiful, evolutionary qualities of the Constitution of the Universe are enlivened in all aspects of life—physiological, psychological, sociological, and the collective level of the whole society. When large groups practise Maharishi’s Transcendental Meditation and TM-Sidhi Programme including Yogic Flying together in one place, the qualities of the Constitution of the Universe become enlivened in the whole society, and, if the group is large enough, in the entire nation and world. These results have been documented by more than 600 scientific research studies on Maharishi’s Transcendental Meditation and TM-Sidhi Programme, conducted at over 200 universities and research institutions in 30 countries. The following research findings on Maharishi’s Transcendental Meditation and TM-Sidhi Programme document the growth of the forty fundamental qualities of the Constitution of the Universe blossoming in individual life and in society. For each quality, the first three paragraphs demonstrate the growth of the respective quality from the physiological, psychological, and sociological perspective of individual life, and the fourth paragraph documents the enlivenment of the respective quality on the collective level of the society as a whole. The numbers cited in parentheses after each research finding are the numbers of the research studies from which the respective finding is taken, as reprinted in the first six volumes of Scientific Research on Maharishi’s Transcendental Meditation and TM-Sidhi Programme—Collected Papers [over 5,000 pages; Volume 7 in press].